The newest addition to Derry's music scene, local band Plain Zebra. Photograph courtesy of Sinead Crumlish. 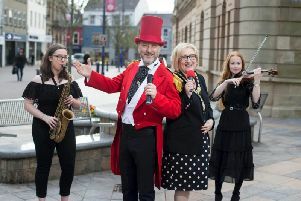 A group of local musicians are hoping to inject new life into Derry’s music scene and travel further afield with their new band Plain Zebra. And the sound doesn’t disappoint. Their EP has already caught the attention of those tasked with organising the lineups for Ireland’s biggest music festival, Electric Picnic. Musician Caolan McLaughlin, who is also a regular solo performer in Derry’s live music scene says the band are looking forward to showcasing their sound to the public on Thursday coming when they perform in the Back Room at Sandino’s. man is Vadim Zeberg (lead vocal, standing accordion, mouth organ). Caolan says he makes his money from performing live across the city as well as gigging in Europe, but that a number of different factors are making it difficult for musicians to earn a living here. “Last year, when we had City of Culture, things were very different. For me, one of the highlights was having Other Voices here. The fact that there were 400 applicants for Other Voices shows just shows how many bands we have here and so many bands were made by getting to appear on that show. Plain Zebra will play with the Wood Burning Savages and Mark Black and the trips in a special gig in Sandino’s Back Room on Thursday coming. Admission is £5. They will also play the Greenroom Live at Voodoo in Letterkenny on Friday December 19th alongside the Wood Burning Savages and Kate O’Callaghan. Catch musician Caolan McLaughlin in a live solo gig in Bennigans Bar tonight, from 9pm. This is a free event and all are welcome! Further entertainment update on www.derryjournal.